One of our most beautiful woodland wildflowers, but the flowers are also perhaps the most fleeting, often lasting only a day or two or three, depending on weather. When Twinleaf is about to bloom I find myself hoping for a spell of cool, dry weather, to prolong the life of the delicate flowers. Even after the blooms are spent, the foliage continues expanding and becomes interesting and ornamental in its own way. Later the plump seed pods open from the top spilling out the seeds on a breezy day or in an early summer thunderstorm to be gathered, dispersed and planted by ants. 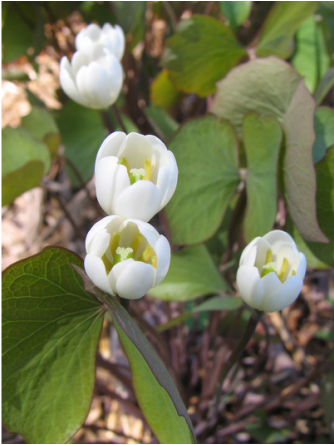 In this way, Twinleaf often spreads itself around the garden.